Relatives are in town. Where do we go for a special family Sunday lunch? Rockpool? Nup. Quay? Nup. Marque? Nup. Kabul House in Merrylands? Yes! We wonder if Kabul House was once an old Greek cafe - the shop is set out that way with the counter down one side of the shop and tables on the other. 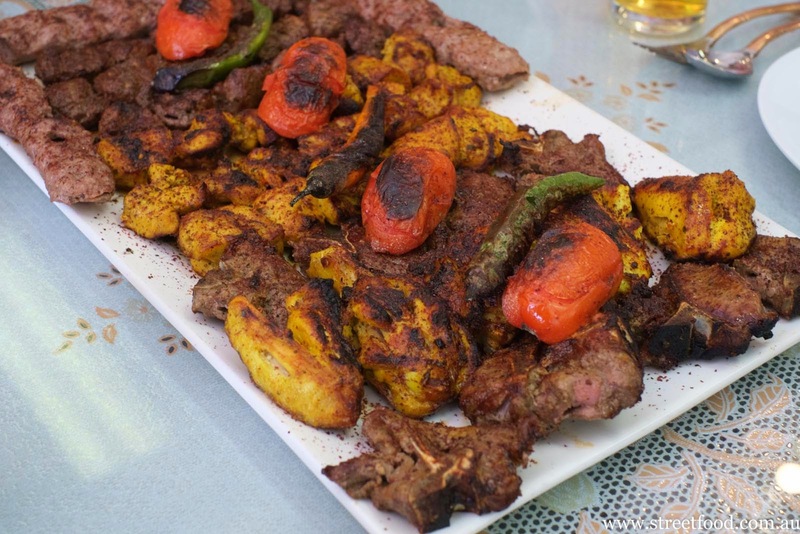 The menu focuses on grilled meat, much like the other couple of Afghani joints we've been to around here, it's kind of like having a Sunday bbq. Dough (also known as dogh or doogh) - $3 per glass or $9 for one litre jug. 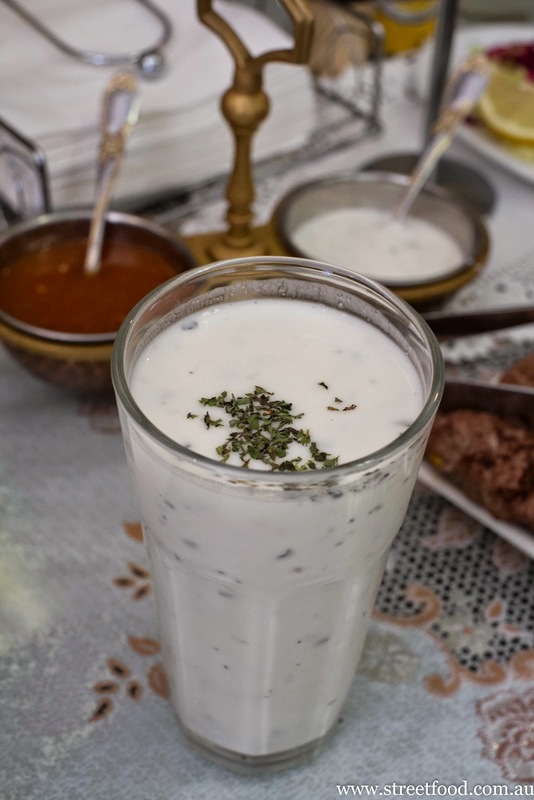 Unsweetened drinking yoghurt sprinkled with dried mint. This yoghurt drink is one of our favourites, a thinned yoghurt with a milk like consistency but with all the tang. 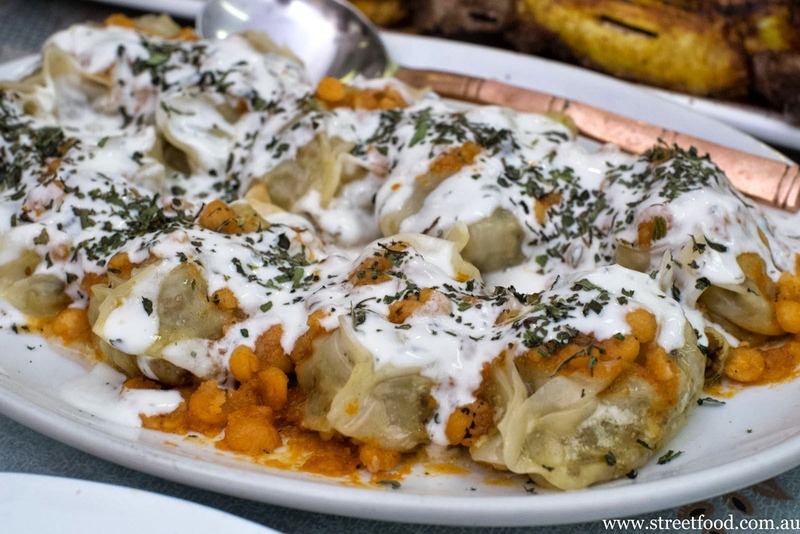 Mantu - $15 for 10 dumplings. Pasta filled with minced lamb, cumin and onion, topped with daal, yoghurt and mint. 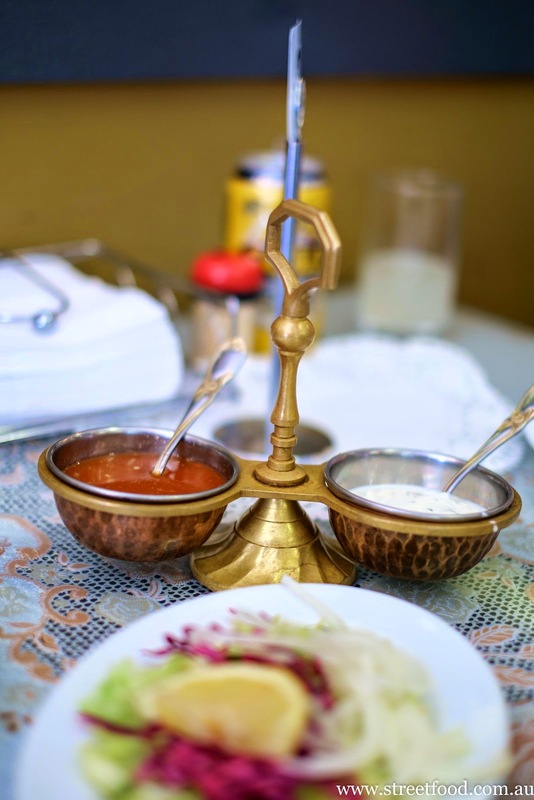 The daal sauce is different to the one we tried at Walli Asr which is tomato based, and it's also quite different to Turkish versions we have tried. It's quite a rustic dish, pretty good but the mantu at Walli Asr blew our minds. 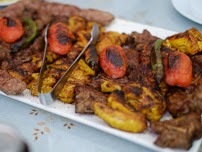 For feasting sake we choose the kabul platter ($75) which comes with a barn full of grilled meat, rice, salad and bread. It fills four of us up to our chubby cheeks, and we doggy bag about a third of it. We know we've over-ordered but we want to try everything. We chose the kabul platter over the cheaper Bamiyan Platter because it comes with two styles of rice. The white rice tastes like it has been tossed in butter. 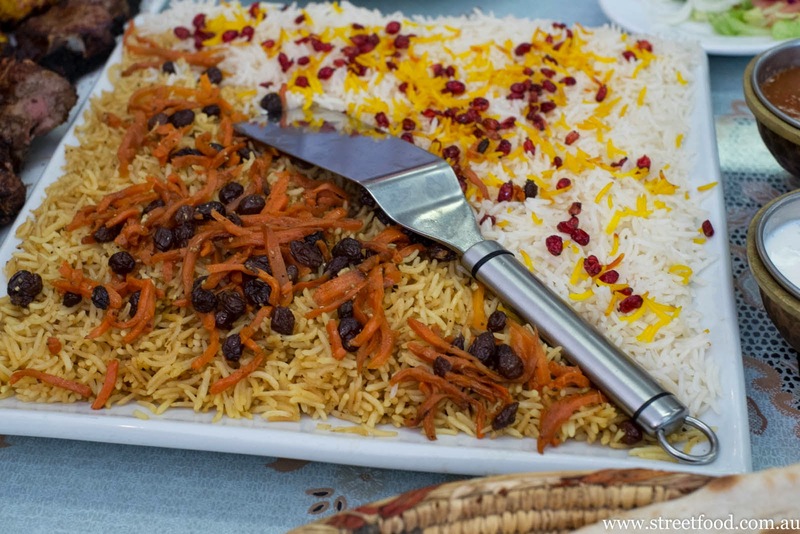 The yellow rice with sultanas and grated carrot has Indian flavoured spices, similar to biryani. The kebab platter inspires a chorus of oohs and aahs from our table, we couldn't capture it's full glory in the photo, it looked stupendous. And huge. Four of us don't get close to finishing it. The choppan (lamb chop) kebabs were the favourite of the table, lightly spiced and perfectly cooked, though Mr Shawn's pick was the Kabul kebab which was lamb backstrap, 'nuff said. The yellow chicken thigh pieces were popular, they had a touch of the El Jannah style charcoaled skin. The rissole-esque Kufta (lamb mince) kebabs are plain by comparison, nice but the last kids picked for the team. 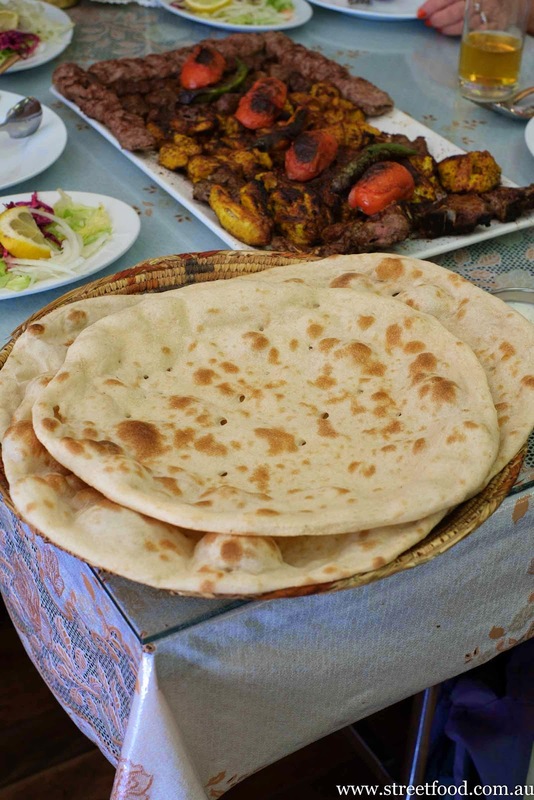 Afghani nan bread comes with with the Kabul platter and is cooked fresh to order. 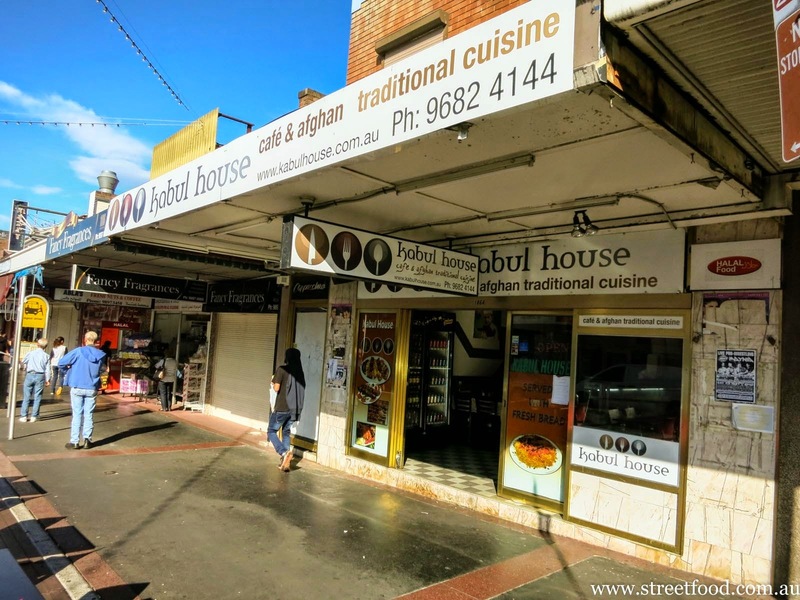 Kabul House is at 186A Merrylands Road, Merrylands. www.kabulhouse.com.au. Phone 9682 4144. NB - Shawn had to a google a list of fancy restaurant names for the introduction. Though he had heard of Rockpool. I have stumbled on your blog and absolutely love it! 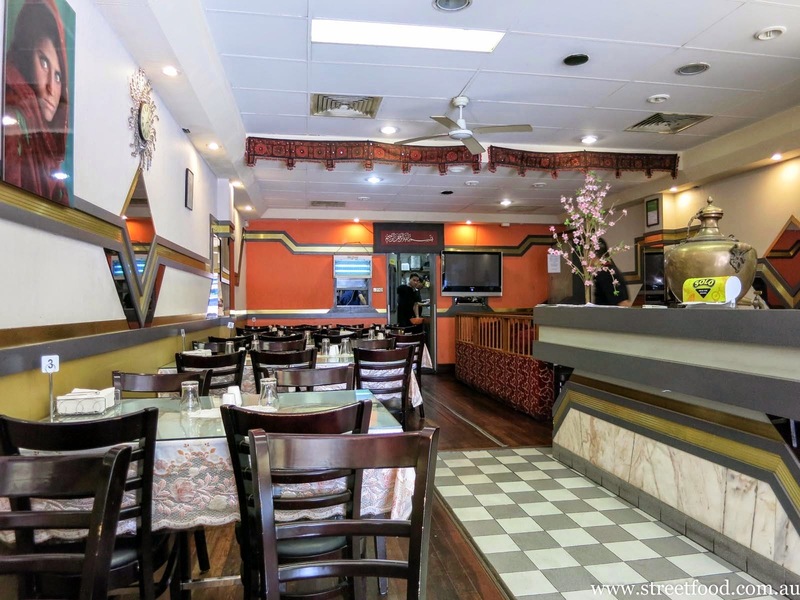 It seems as though Merrylands is the place to go for some good Afghani food. Thanks Sarah, we had some wonderful eating adventures in Merrylands and hope to get back soon.